No singer, no label. What else can go wrong? As the long-awaited release of Axl Rose's version of Gun N' Roses' Chinese Democracy looms, word is that Velvet Revolver has been dropped by their record label, RCA. 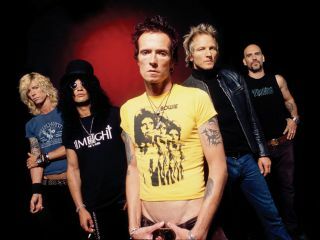 Velvet Revolver features ex-Guns N' Roses members Slash, Duff McKagan, Matt Sorum, along with guitarist Dave Kushner. The band has released two full-length albums through RCA/Sony BMG - 2004's Contraband, which sold 1.98 million copies in the US, and its 2007 follow-up, Libertad, which moved only 301,000 units in the US. Despite their dramatic drop in sales, the band toured steadily until April of this year, when they fired singer Scott Weiland for erratic behavior and drug use (Weiland has since returned to his old band, Stone Temple Pilots). Since the summer, the band has been auditioning possible replacements for Weiland. Rumored candidates have included ex-Skid Row singer Sebastian Bach, former MTV VJ Steve Isaacs (who sang for The Panic Channel), ex-Spacehog vocalist Royston Langdon and Lenny Kravitz. In an exclusive interview with MusicRadar, bassist Duff McKagan talked about the group's search for a new lead singer: "It's hard, man, but it's gotta be the right guy. To be honest we thought we'd have a singer right away, but things don't always happen the way you want. "We worked with Royston and had high hopes for him. But it just wasn't right - alas. So, back to the drawing board." Regarding the rumor that Lenny Kravitz was close to joining the band, McKagan simply chuckled. "Lenny was a blatant rumor. I don't even know where that came from. "The fact of the matter is, we don't have a singer. We don't have to rush this thing. Our singer has to be great, he can't just be good. We'll know when we know." And when they know, they'll be on a new label.